Say goodbye to a certain kind of extended family. 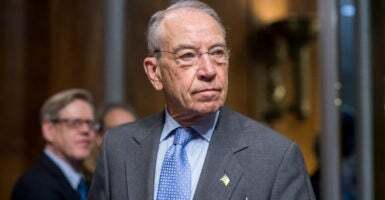 Sen. Chuck Grassley, R-Iowa, wants to close loopholes in the farm bill to stop lining the pockets of remote landowners and guarantee that working farmers and their immediate families get the government subsidies they are eligible to receive. “One of the most egregious loopholes that we need to fix deals with what it means to be ‘actively engaged in a farming operation,’” Grassley said during the Heritage event, which also featured a panel of experts. Grassley’s amendment would tighten restrictions on who receives farm subsidies, boiling down eligibility to only farmers and their immediate families who live and work on the farm. The Iowa Republican’s proposed amendment aims to close loopholes that analysts say have given 10 percent of American farmers over 70 percent of the subsidies. Right now, the farm bill, which has been renewed and revised every five years since 1920, has a loophole that allows $250 million in subsidies to flow only to the largest farms. These farm operations then can outcompete younger and beginning farmers, with the Department of Agriculture having no way to make sure those most in need get the help. Grassley, a farmer himself and member of the Senate’s agriculture committee, has been part of making policy on American farmers for 37 years. He has worked on many farm bills and helped craft the 2014 version of the bill. Grassley, also chairman of the Senate Judiciary Committee, said he expects his new amendment will be introduced on the Senate floor Wednesday, noting it has support from his fellow Republicans but not characterizing support from Democrats. “We need to get a farm bill that we can justify to the American taxpayers, and I plan on helping to do this by making a few improvements to the farm bill and getting it through the entire Senate,” Grassley said, prompting applause.